Happy Day-After-Thanksgiving to all my American readers! Did you have a nice Thanksgiving Day? Today is Black Friday. Are you shopping today? I not but I might go out tomorrow for Small Business Saturday to help support our local small businesses. Like my local yarn shop. Anyway we had some good, some bad, and some ugly for Thanksgiving. We discovered that we have “pantry moths“. And they lay eggs that turn into gross larvae. We’ve seen these moths for a couple of weeks but no nest. I did find some larvae near a bag of macadamia nuts and killed the larvae and tossed the nuts. The moths are still around but the larvae are hiding. Bad and ugly. I was making my pumpkin pies Wednesday evening and needed more flour. I sifted through the new bag of flour as I put it into a Tupperware container and found none. Good. I also needed to refill my sugar container as I only had about one cup and needed more. The new sugar bag had some webs and larvae on the outside and in. I put the bag into a zipper bag and tossed into the garbage can outside. The second bag of sugar had larvae inside so I tossed as well. I had no more white sugar. Bad. So I substituted brown sugar for the rest of the white sugar I needed for my pies. Good. I hate to tell Mr. Aitch about any substitutions so I waited to tell him about the brown sugar until he had some of the pumpkin pie after dinner. As I was getting the pie out of the refrigerator, he told me that pumpkin pie was not his favorite and was edible for Thanksgiving. We’ve been married for 40 years and this was the first time I recall him telling me he was not a fan of pumpkin pie. Whatever. He took a bite and raved about how good it was. He said he might have to reconsider he ranking of pumpkin pie. I told him what happened and said I need to substitute brown sugar for the white sugar every time. He even ate a second piece. Good. We were supposed to have the traditional green bean casserole. It was in the oven and just needed the sprinkle of onion rings on top and five more minutes. I pulled the casserole out and Mr. Aitch sprinkled on the onion rings. Then as I was putting it back in the oven. the dish slipped off the rack and bounced onto the hardwood floor. Upside down. Bad. We scooped up the mess with some spatulas and cleaned the floor. We were fortunate that the casserole dish didn’t break and no one got burned. So I just opened a can of plain old green beans to have instead. Good. 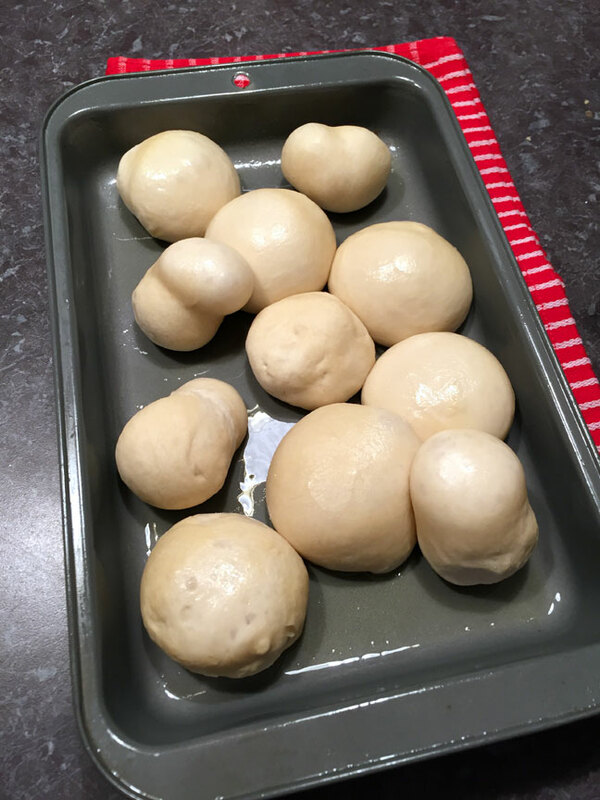 I planned on having home-baked rolls, too. But they didn’t thaw or rise in time. I think some had freezer burn as once they did start to rise, they were rather deformed. Ugly. 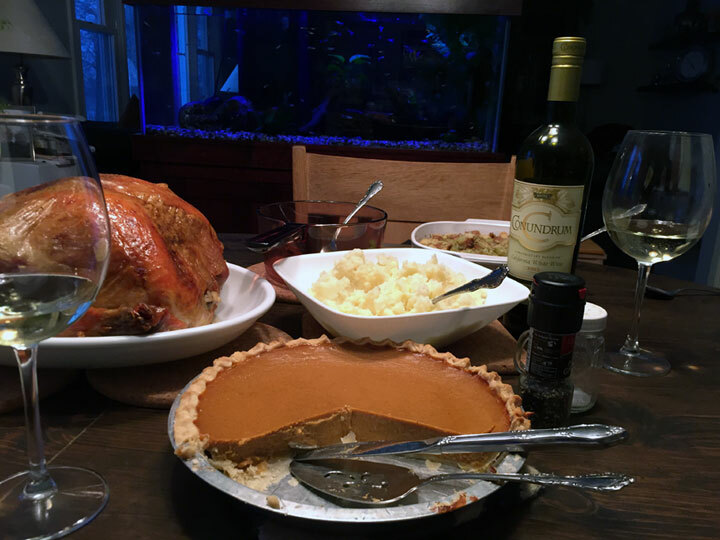 The meal was still good – turkey, stuffing, mashed potaotes, green beans, Conumdrum white wine, and pumpkin pie. We are very thankful for all our blessings. Did you have some good, bad, or ugly for your Thanksgiving? This entry was posted in food, good eats and tagged cooking disasters, food, pests, pumpkin pie, thanksgiving by Patti_is_knittinginflashes. Bookmark the permalink. The bad-I had to work. The good-we ate at Bobs and I got 50% off our dinner because I had worked. Good-i got a $10 tip froma nice man because I had to work. Bad-did not get to spend time with family. However, a good day all around. Now that’s a memorable day!